September 21, 2016 — Two years ago, Denetta Dunlap was just returning to her hometown of Montrose for a new role — a victim advocate for the 7th Judicial District. She proved adept: Just last week, the Colorado District Attorneys Council named Dunlap named Victim Advocate of the Year. 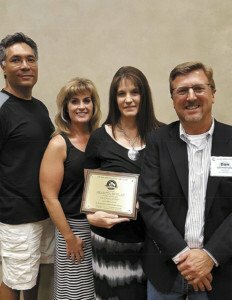 Denetta Dunlap, third from left, Victim Services specialist for the 7th Judicial District Attorney’s Office, stands proud with the award naming her state Advocate of the Year last week in the Denver area. With her, from left, Deputy District Attorney Seth Ryan, Aimee English, Victim Services supervisor, and District Attorney Dan Hotsenpiller. Advocates assist people identified as victims under the Victim Rights Act with a range of services, support and outreach. This includes communicating with victims or family members about the case and ensuring prosecutors know their needs and wishes. District Attorney Dan Hotsenpiller nominated Dunlap for the state award. Dunlap is both compassionate and firm when necessary, Ryan said. “She just strikes a great balance,” he said. Dunlap worked for the 21st Judicial District’s DA, then in the courts there, before moving on to the 14th Judicial District’s DA Office as the office manager. She applied for a legal secretary position here two years ago, in hopes of returning home. Hotsenpiller asked her how she would feel about becoming a victim advocate. Dunlap shepherds sexual assault victims through the court process, and often takes it upon herself to keep in contact with them, even after a case concluded. Understanding the court process poses a challenge for victims and Dunlap helps them in that regard. “The key for me is to listen to them first. We’ve got to listen to them before we can help them,” Dunlap said. 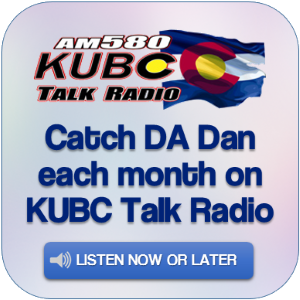 Dunlap is one of six victim advocates working for the DA in the 7th Judicial District, which encompasses Montrose, Delta, Hinsdale, Gunnison, San Miguel and Ouray counties. Although her job can be challenging, Dunlap said she is glad to be able to relay the victims’ feelings to Ryan, along with the understanding that they have been hurt. “Being a voice for victims is very satisfying,” she said. Dunlap encouraged others to consider the field of victim advocacy. “I think there needs to be a lot more advocacy everywhere,” she said.